Unlike many cities, New Orleans has a bewildering array of breakfast choices. While in many cities, the difficulty is in finding a place for breakfast, in New Orleans, the difficulty is in deciding which place to choose. Surrey’s is a juice bar and a cafe, and at first that had me somewhat concerned. Would there be substantial and traditional breakfast items, or would everything be “healthy” or “vegan”? But the place got rave reviews on Yelp, so I gave it a chance and I’m glad I did. Surrey’s Uptown is on Magazine Street, in a charming, fairly-small house. They do indeed have a traditional breakfast menu at exceptionally-reasonable prices. Bacon, eggs, biscuits-all were exquisitely prepared to order, and the roasted potatoes were an outstanding alternative to the usual grits or skillet potatoes. 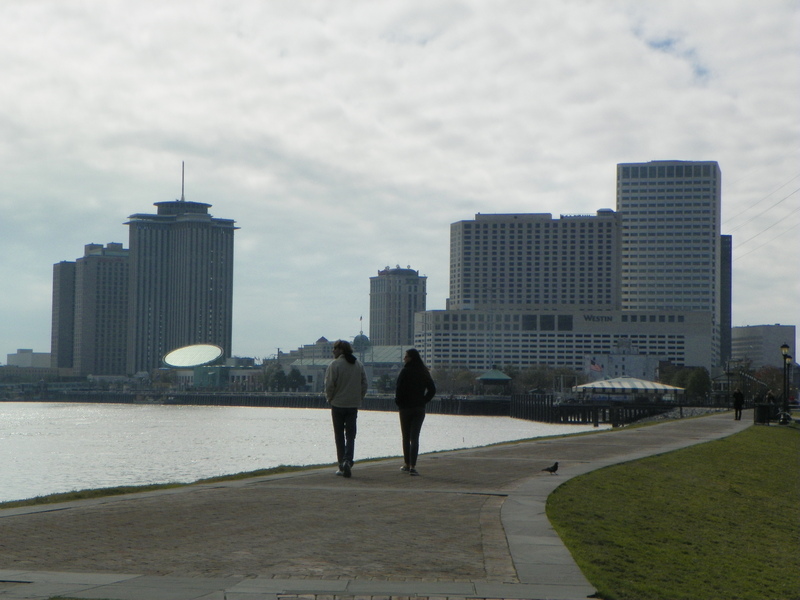 While I was able to get right in on a Tuesday morning, the place seems small and probably fills up quickly on weekends, and it’s a fair distance from the French Quarter. Nevertheless, it’s worth the trip for a breakfast that will leave you and your wallet comfortably full. Visit http://www.surreyscafeandjuicebar.com/Surreys-New-Orleans-Restaurant.html for menus and hours. 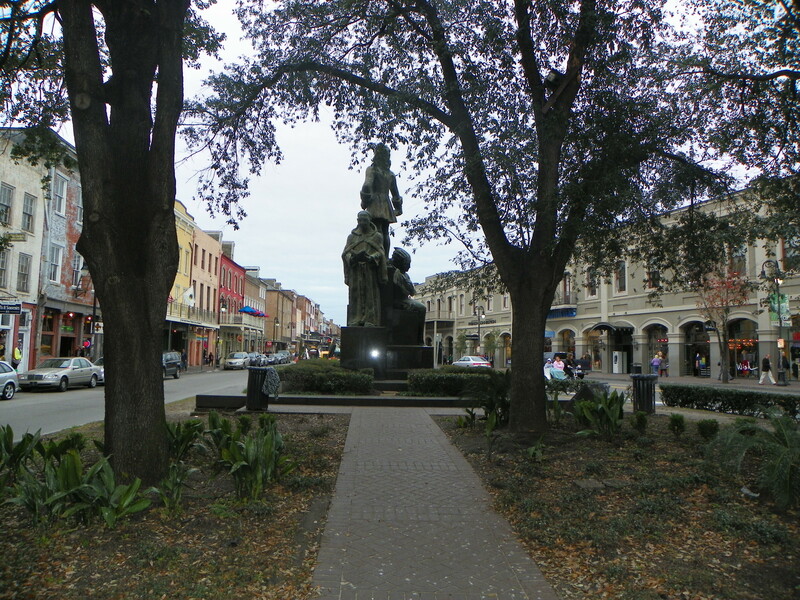 People often say that New Orleans is America’s most European city, and one of the things they may have in mind is the frequency with which one encounters monuments in the city. They literally pop up everywhere, and probably are noticed by tourists more than locals. Back when Jackson Square was the Place d’Armes, the land on either side of the square was also public property, but somehow the land eventually became private property, and owned by a Baroness no less, the Baroness de Pontalba. She chose to erect on her land two apartment buildings which still stand today, and which give New Orleans another claim to fame as the city with the first apartments in America. In the early afternoon, this traditional brass band was playing in front of the Cabildo at Jackson Sqaure. The song, “Everybody Ought to Know” is a Sunday School song from my youth that I never knew was part of the brass band tradition, but it definitely works. While enjoying my cafe au lait and beignets at the Cafe du Monde, I thought I heard the satisfying boom of a bass drum. 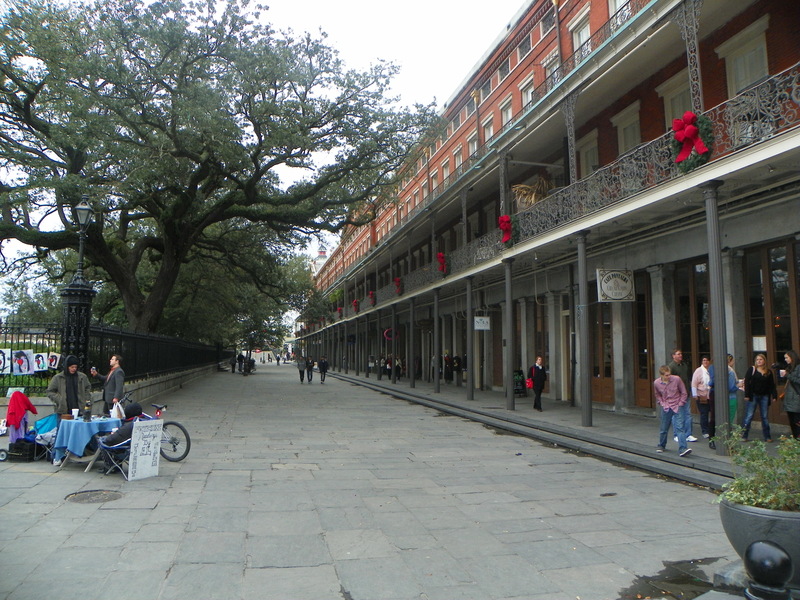 It proved to be coming from the other side of Jackson Square, in front of the Cabildo, where a traditional brass band had set up to play for the handful of tourists out on such a cold, dark and windy day.